Cleveland Golf loves its wedges, and so do many golfers. From its highly-regarded 588 Gunmetal wedges on up to the CG 11, Cleveland has invested quite a bit in its long line of short golf clubs. 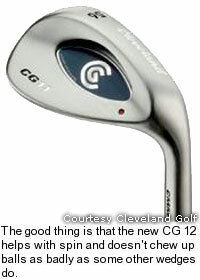 Now the company has its newest, high-spin wedge, the CG 12. National Golf Editor Tim McDonald gave it a try and found the CG 12 to be an extremely reliable and consistent club - even with his extremely unreliable and inconsistent swing.